Reader Challenge.. I can hear a you all asking ‘what is the reader challenge?’.. Well, I am not so sure it is a challenge, but more so for some reader input! The Challenge is for my lovely readers out there (yes, you!). 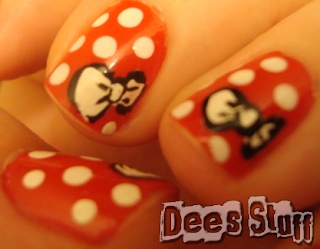 Have you ever come across a nail art image that you are too scared to try/just don’t know how to go about doing it? WELL! I will try it out for you. I can post up tutorial pictures of how I went about doing it so that you can either just see it done (to the best of my ability) or learn some easy routes to trying it out yourself. I don’t believe in difficult methods. I think things should be simple yet effective. In my perfect world (aka my mind) I feel being ‘challenged’ at least once a week would be great, but I’ll settle for every once in awhile. I will leave this challenge up on the side bar so that it will always be a constant reminder. There are a couple of ways to go about this. First, you either have to send me a photo of your idea or just explain it and I will draw it out and double check to make sure it is what you were thinking of. Second, sending your idea and or picture to me – it can be done via e-mail (delaynee88@hotmail.com) or just leave it as a comment and I will get to it. I am not sure what the response will be on this, but I was working on my nails last night while gaming and figured I would issue this ‘challenge’ and see if anyone would take me up on it. I don’t care how difficult it is.. I will post the photos up even when I fail – I am trying to have no shame!! I think it could be a lot of fun.. So please, any crazy/fun/silly/pretty/ugly nail art designs you have come across.. Challenge meeee!! I have a lot of images myself, but I’d like to see what others can come up for me to try. Now for some quick looks.. My mom had asked me if I would paint her nails for her.. So of course I did! It is like a sickness.. I will people to ask me to do their nails! She said I could do whatever with whatever colours.. But the last time she said that and I tried to use red, well, it didn't happen. Using CG II, Orly Glam Rock, Black SilkLine and my trusty bobby pin..
She is really happy with them and so am I. 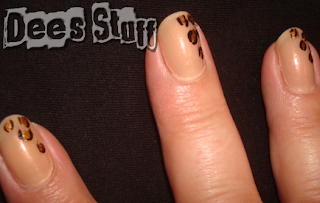 It allowed me to practice 'cheetah print'. Then, since painting her nails again reminded me of the red nail polish debacle, I decided to use red on myself. I used Essie Lollipop, OPI Alpine Snow, Black SilkLine and my trusty bobby pin.. The bows are not too impressive.. Anyways.. There was my quick (massive) update! Enjoy the rest of your magnificent Monday!! Okay, I really don't have any specific ideas really.. But I'm always trying to think of ocean or beachy nail art. Also, I think I need to learn how to do cupcakes, my younger sister loves all things cupcake.